Wheels are now make out of steel, aluminum and a variety of exotic materials to meet the needs of both show and commercial uses, and tires are available to meet those same needs. Hubcaps and wheel covers are no longer popular but there are millions of vehicles that still have them and hundreds of companies that specialize in providing them for vintage and classic vehicles. The following companies specialize in wheels, tires and/or wheel covers for brass, antique, vintage and classic cars, hot rods, muscle cars, trucks and vans, motorcycles, motor homes and trailers. If you have a concern or comment about a listing please contact our webmaster@antiquecar.com. http://protouringbilletwheels.com/: Pro Wheels specializes in Billet wheels for hot rods, muscle cars, and American classic cars. They offer a wide variety of color options and wheel styles to best fit your unique vehicle. Pro touring billet wheels are made in the USA. Each wheel is crafted from 6061-T6 aerospace grade aluminum for the ultimate combination of brilliance for a mirror shine, strength for safety and durability, and light weight for speed. http://www.Hubcapzone.com/: The Hubcap Zone sells new and used hubcaps, center caps, trim rings, wheel skins, and wheel simulators. They provide free shipping in the United States and international shipping is available. They have been in the hubcap business for over 20 years and carry factory original hubcaps, aftermarket hubcaps, OEM center caps, wheel covers, wheel simulators, wheel skins, and trim rings. They also carry hubcaps from current models to classics, back to the 1940's. They strive to make your hubcap purchase as easy and as pleasant as possible. http://www.customwheelsandcarrims.com/: Custom Wheels and Car Rims specializes in custom wheels, car rims and truck rims for daily use or exotic and show vehicles. They offer wholesale prices on custom wheels, spinner rims and car rims and shipping is free. http://www.tire-discounted.com/:Tire Discounted is a discount tire store that offers name brand tires for passenger cars, trucks, SUVs, sports cars and off road applications. Their tires range from 17 to 26 inches and they will pay for the shipping. Their tire brands include BF Foodrich, Cooper, Falken, Michelin, Nitto, Pirelli, Wnli and Kumbo. http://www.discountedwheelwarehouse.com/: Discounted Wheel Warehouse offers wheels and rims at discount prices for custom vehicles, trucks, and cars and they provide free shipping right to your door. They are an industry leader that promises low prices, fast shipping, a two year warranty and excellent customer service. 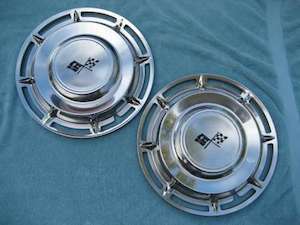 http://www.hubcaps-wheelcovers.com/: Hubcaps Wheel Covers sells new and used hubcaps, wheel covers and rims online and they will provide free shipping. They claim to be the largest and best source for factory wheel covers, center caps, aluminum wheels, alloy wheels, steel wheel rims and wheel skins for cars, vans and trucks. They have been in business since 1958 and take great pride in their customer service.